When he was just seven years old, Alex Castro worked out a deal with the manager of an electronics store. Castro would answer the customer’s tech questions, and the manager would permit him to write simple programs on the store computers. The hobby turned into a passion and eventually a career. Today the vice president of product management at Electronic Arts, Castro has worked alongside CEOs like Bill Gates, Steve Ballmer, Jeff Besoz, and now Andrew Wilson at some of the world’s most influential tech companies. He chats with HE about his first computer, how Electronic Arts is using big data, and who’s watching your touchdown dance in Madden NFL. When did computers first interest you? I saw a computer magazine in my dad’s briefcase in 1981 and started going to the library to type in the programs I read in the back of the magazine. I knew then that I wanted to work with computers. Did your parents encourage this? Oh, for sure. My dad went to RadioShack one day and came back with a Tandy 1000 computer. I remember it cost him $1,742, which was a significant portion of his income. My mom was not happy about spending that kind of money. I remember them having a heated discussion as I went to bed that night, but my dad kept insisting that it was for me, for my future. Did it seem real then? That you could make it a career? Someone along the way told me I’d have to be good at math, so I started caring about school. I even formed programming teams, which was my first foray into leadership. It wasn’t like it is now with lots of students interested in the field. To form these groups, I had to search math and science classes for four or five other geeks. I opened the yellow pages and called some local tech companies to sponsor us. When it came time to apply for college, I saw a scholarship advertised in the back of a magazine and got accepted to Cornell. After completing my undergrad, Microsoft paid for me to get my masters. That launched you into an era where you worked with some pretty amazing leaders. What was your time there like? The first time I realized I was actually smart was when I was at Microsoft. I had a manager who praised my intelligence—I always thought I was just working harder than anyone else. At Microsoft, I worked alongside amazing individuals like Bill Gates, Steve Ballmer, and others who helped me change my self-perception. And from there you went to Amazon? Yes, to work on cloud infrastructure. I saw Jeff Besoz accomplish some incredible things with infrastructure and data and algorithms that still influence what I’m doing now. Electronic Arts (EA) is the granddaddy of video games, but we continue to operate in a world that’s changing fast. It’s no longer about putting a disc in a box. People are interconnected and playing on mobile platforms. We need to understand what’s happening, what players are doing, and what’s working well. In the same way Amazon can recommend books, suggest other products, or send a personalized email, we need to leverage data and algorithms to create an enhanced and personalized customer experience. That’s why Amazon is so successful, and that’s where video games are headed. We’re collecting data on user behavior to perfect how we interact with gamers and protect the experience they have. Maybe we can identify when someone builds an automated robot to cheat and ruin a multiplayer experience for other gamers. Or if someone is playing SimCity 4 and gets stuck, we want to know. If our data shows that they’ve not reached certain milestones after two weeks, we know they’re not engaged and are likely to drop off and never return. That’s an engagement problem. What would you do in that case? If we see this as a pattern in the data, we want to analyze why. Is the game too complex? Do users not understand that other game functions will open up as they progress? We can react. We can send them a targeted, personalized message via e-mail, text, or in-game messaging to entice them back. Maybe we use a video that shows them how to build a power plant, or maybe we give them 10 free coins to use in an online marketplace. So if data allows you to react to gamers, have you been able to harness any predictive capabilities? Data is important to our marketing efforts because if we can identify people who already have an interest in our games, we can let them know when we have a new version or another game they might purchase. We take all the data we have and give players predictive scores based on how likely they are to do certain things. How do you gather all this information? Is it all through online gaming? Mostly. We collect “events.” We know when people log in, how long they play, what levels they achieve, how many awards they win, and what they purchase. That game play info goes up to our servers in the cloud. My team is here to give EA the same kind of processing power and intelligence that companies like Google, Facebook, and Amazon have in a way that lets us interact with users individually while protecting privacy. The obvious question, then, is does this change game play? We’re really careful about that. We have a new CEO, Andrew Wilson, who is a gamer, and whose mantra is, “Players first.” We have adopted that attitude by keeping the focus on what’s right for the player. If we do that consistently, we’ll make money along the way. What’s the biggest way the rise of mobility is changing the industry? We’ve just started seeing mobile gaming outpace consoles for the first time, especially in parts of the world where people aren’t rushing out to buy every $500 console that comes out. Those people have smartphones and Internet-connected devices, and those become the game platforms. They will be a big part of our future. 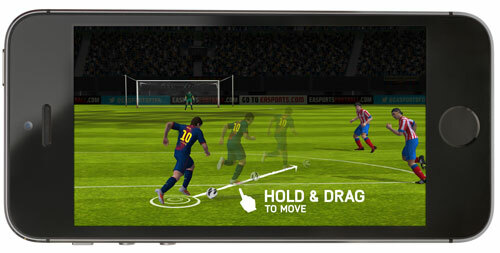 EA’s FIFA title is one example of how the publisher is excelling in the mobile space. Meeting its gamers where they want to play with uncompromised quality and entertainment, no matter the platform, EA has earned a loyal international fan base for the game. In 2013 FIFA sales across platforms accounted for more than a quarter of the company’s net revenues. But how can you shrink a huge EA title to work on a three-inch screen? That’s the wrong way to think about it. You’re not taking a console game and making it smaller because it’s fundamentally different. That line of thinking puts the technology first and the player second. We focus on creating a great experience on a mobile platform. The interaction with the game may have similar elements, but it’s different. I think our FIFA team really nailed it with this concept. For the last few years, the overall tech industry has been very focused on collecting this massive wave of data that’s never existed before, but we need to figure out how to do smart things with the data we have. We’re at an inflection point, and it’s going to be exciting.